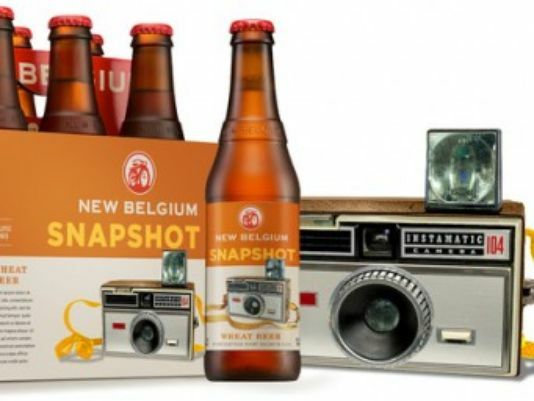 It was apparently one of Kodak's biggest successes and now a Colorado brewery has decided to recognise the important role that the former film giant played in their state by featuring the Instamatic on a new beer. Kodak had a major presence in Windsor, Colorado for decades until it pulled out last year as part of the Kodak Alaris spin-off. New Belgium Brewing seemed to have this in mind when it debuted it's new Snapshot ale earlier this week with a hand-painted Instamatic 104 image on the label. The company said, "We thought it relevant to Snapshot and nostalgic and awesome." Did the Scots and Brits have Instamatics? I had that shown model, and have many shots I love from it. I took the lens out a few years ago, and mounted in a Leica to T mount adapter so now I can still use the lens. I think everywhere had an Instamatic! There are probably a few in a hut in the Amazon rainforest. The 104 was the first camera I ever used. They built a lot of Instamatics locally at the Kodak factory here in Australia. I was 14 when the Kodapak cartridge (126 size) was introduced in 1963. To a 14 year old it was just amazing, wow, I didn't have to thread film on my moms 616 box camera anymore. But no way was my folks going to spend money on such a frivolity, not when the box camera was still doing a fine job. So when I got out of the house and got a job I finally got my own camera, but not a 126. By that time I wanted something fancy and bought my first camera, a Minolta HiMatic 9, now long gone. We just started getting New Belgium in Ohio... cant wait to drink this. Its about time someone combined my two loves.